Double Dragon II the Revenge, another piece of art from the Nintendo NES I just finished. This time, reached the end by myself playing SUPREME MASTER mode! Do you remember when you were younger playing this game, with your brother, rich friends or family? It was my favorite Beat’em All game ever! And still top 10 on my list! Did you know that the original Title was : Nekketsu kōha Kunio-kun: Bangai rantō hen (熱血硬派くにおくん 番外乱闘編) ? Kinda hard to pronounce huh? So they change it to Double Dragon, great move. I was always fighting to get the blue one, don’t ask me why, Blue is better. Gave me authority I guess. So everybody was fascinated with the powerful kicks and the super knee kick, but nobody could say how to perform it! We were kids, we did randomly without knowing right? Even now you can’t find a clear explanation on how to do it. Anyway, I wanna launch a flying knee kicks contest, let me know if you’re down for it in the comments! 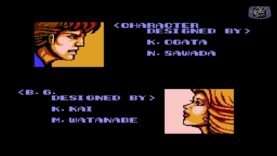 Enjoy Double Dragon II the Revenge Ending video!